Flint in Flintshire, located just along from the A548, has a population of only 18,000 but it boasts an incredible history which dates back thousands of years. Flint has some beautiful churches and sits adjacent to some lovely mountains and high plateaus. 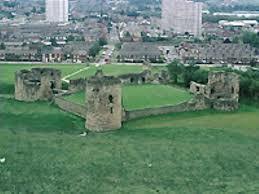 It is also home to Flint Castle, one of the first castles built in Wales. 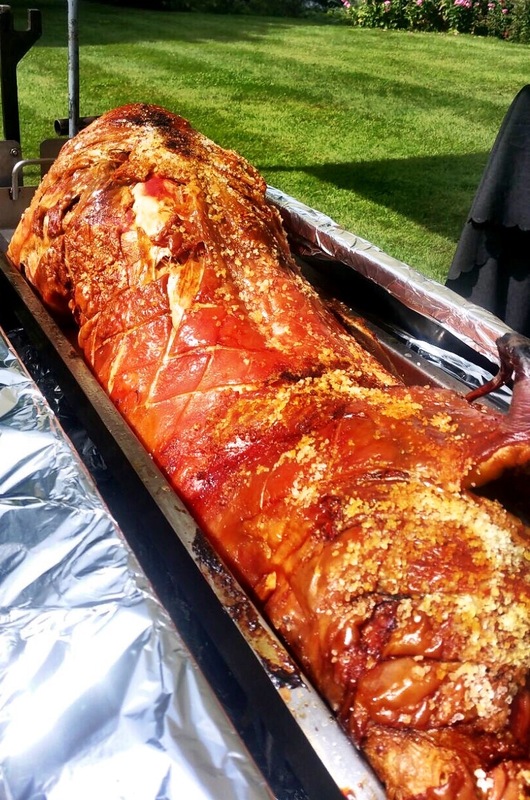 It was erected in 1277 by King Edward I.
I am a caterer in North Wales, specialising in hog roasts, and I’m happy to say, Flint Town Council invited me to create Hog Roast Flint, to be held in mid-summer at their Friday market for which they are well known. I decided, given the history of Flint, I would honour it by roasting a whole locally-sourced and lovingly-raised Welsh Pig and King Edward potatoes. 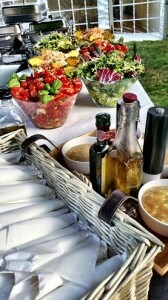 Slices of juicy pork were served in warmed rolls and served hot with various accompaniments. The market in Flint is very popular. The locals are very proud of not only their pigs, but their fresh produce as well. This particular summer’s day was sunny if not warm. Unfortunately, the British summer can sometimes make outdoor cooking a trial, but I always make sure I bring along my Titan for the big events as well as a three-sided marquee, which is easily erected, if it is needed. When I make sandwiches and simple roast jacket potatoes for the crowd, I only need the help of my partner. I find roasting foods on my Titan very easy indeed. All the work is done for you as the machine does perfectly what it was created to do. The manoeuvrability of the machine is quite an accomplishment of design and good, sturdy wheels. This ensures I can set up wherever I’m asked to, be it the beach or grassy areas. As I always do, I arrived early enough to ensure the meat was spitting along nicely just as the crowds began to thicken toward mid-day. And, as per usual, a crowd had gathered well before the meat was ready to have a good look at the Titan, which I purchased a few years back from The Spitting Pig Company. I also subsequently purchased their Hogmaster hog roast machine, and sometimes, if I’ve got a large crowd to cater to, I contact the Spitting Pig for what I call a hog roast hire Flint which could be another machine, an add-on, or even waiting-on staff, depending on my needs. I find working with the Spitting Pig Company is a real business partnership and they’re always there with not just help, but advice as well. People’s interest at Hog Roast Flint was nothing short of amazing. Everyone wants to know how it works, what it costs to work it (it runs on cylinders of gas as well as a power source), and how long it takes to cook whatever it is I’m cooking. So, as I minister to my victuals, I get to meet lots of lovely people and, of course, with word-of-mouth being a very important marketing tool, I also hand out lots of business cards. My wife makes a mean applesauce and will often include a gorgeous, succulent sage stuffing, baked in a loaf shape for easy slicing. Both of these, added to a couple slices of juicy roast pork, make an incredible sandwich. With a little forethought about how many people I’m likely to feed, I can easily determine how much of everything to buy. There is rarely anything left over and I can assure you, if there is, it will be carved and left for guests at the event! Therefore, my profit margins are always in the black, which is a very good thing. For this particular event, I chose a pig of approximately 60 kilos and brought along about 300 potatoes. On my Titan, I am able to fit the hog and using the spit-roasting attachment, I can do lots of potatoes simultaneously. As you might be able to tell, I’m passionate about people and passionate about hog roasting. I also believe wholeheartedly in the business practices of The Spitting Pig Company that make my job so much easier. Let’s hope we are able to enjoy events of this type in our own communities with our family and friends around us for a long time to come.